This week’s word of the week is Gutter. Guttering is generally installed around the roof surface edges to direct water off the roof in an orderly fashion instead of the water running off the roof in every direction all helter skelter. Our recommendation is installing seamless gutter which allows for maximizing water capture. a channel at the side or in the middle of a road or street, for leading off surface water. a channel at the eaves or on the roof of a building, for carrying off rain water. any channel, trough, or the like for carrying off fluid. a furrow or channel made by running water. Bowling. a sunken channel on each side of the alley from the line marking the limit of a fair delivery of the ball to the sunken area behind the pins. (of a lamp or candle flame) to burn low or to be blown so as to be nearly extinguished. to form gutters, as water does. to make gutters in; channel. to furnish with a gutter or gutters: to gutter a new house. Gutters are very important in the rainwater harvesting process. Keeping them clean and free of debris for optimum water flow as well as water quality is important. Branches may need trimming to achieve this. There are several methods of keeping the actual gutter trough clean as well. Screen is an option but still allows small debris to travel with the water. We prefer a fine gutter foam that installs right into the gutter and prevents most of the larger debris from entering the rainwater harvesting system. This foam can be taken out of the gutter and hosed off as well much as you can hose off a re-usable air filter for your air conditioning system in your home. Guttering the entire catchment surface gives you optimum rainwater harvesting capability. If guttering is already installed, then you are left with deciding where to put your tank or cistern and where to direct any overflow. This determines where the downspout and first flush diverter (FFD) will be placed. If you do not have gutters already installed, it is easy to have them put up. They can also be placed where the downspouts are already in the proper placement for optimum rainwater output. If you are unsure about whether you have the proper guttering to install a system designed to capture all the rainwater your roof can provide, give us a call. We specialize in estimating and designing a system that is tailored to your needs with maximized water efficiency in mind. We also offer maintenance programs that ensure your system is at it’s peak performance year round with no need for cleaning gutters anymore! Next week we will discuss and define another Rainwater Harvesting System Term. Follow our Blog so you don’t miss it! Thank you for sharing this info with your friends or people you think are interested in it. Categories: Gutter, Rainwater, Rainwater Harvesting | Tags: Gutter, Rainwater, Rainwater Harvesting | Permalink. This week’s word of the week is Catchment Surface. Generally a Catchment Surface is a roof of some type of structure. Pictured below is one type of many different configurations of Rainwater harvesting systems showing the roof as the catchment surface. the act of catching water. something for catching water, as a reservoir or basin. the water that is caught in such a catchment. The square footage of your catchment surface or roof determines roughly how much water you can store. 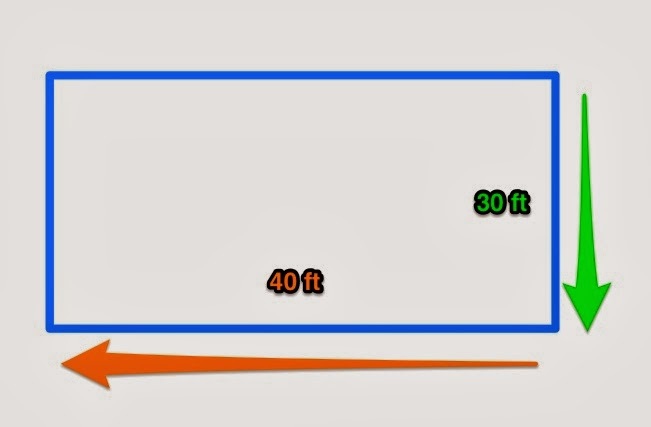 You measure your square footage by measuring the outside of your building on each outside wall. For example in the drawing below we have a very simple drawing to show the measurements. One outside wall is 30 ft and the other wall is 40 ft. Multiply these together to get your square footage of 1200 sq ft roof catchment surface. If the roof is guttered where it should be, then you can capture from this entire surface. If it is not guttered where it needs to be then the roof catchment surface is diminished by that factor. It is important to have guttering installed properly and in the right places to ensure you can capture all the rainwater your catchment surface can provide. Did you know that you can even have the guttering installer put your downspouts in the right location when the gutter is installed? If you are unsure about whether you have the proper guttering to install a system designed to capture all the rainwater your roof can provide, give us a call. We specialize in estimating and designing a system that is tailored to your needs with maximized water efficiency in mind. Categories: Catchment Surface, Downspout, Gutter, Guttering, Rainwater Harvesting, Roof, Square Footage | Permalink. Rainwater Harvesting: What is a Dry System? There are a few types of Rainwater Harvesting Systems. I expect that there will be more variations as we learn more in the future. 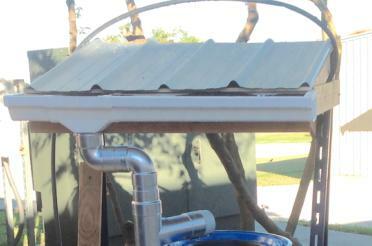 In a nutshell, a Dry Harvesting System takes water from one downspout on a partial roof area of the catchment surface. A catchment surface is most often a roof. It can be any type of roof: on a home, on a barn, an area over a bench to shield from water. Any surface that can be guttered can effectively harvest rainwater. A Dry system is so named because no water stands in the pipes except for the First Flush Diverter which empties within 24 to 48 hours. All the water collected goes into the cistern or tank. If the tank is not large enough to hold all the rainwater collected, then the overflow diverts water to a pre-designed area for the runoff. This allows for a more orderly use for the rainwater and overflow. If you have drainage issues, collecting rainwater and designing the system properly can alleviate many of those issues. Systems can be designed with the purpose of adding additional storage at a later date, however it is far more economical to attempt to estimate how much water you can collect over a period of time and purchase the most storage at that time. It is far cheaper per gallon to design the system that way from the initial install than add on at a later date. Adding on later can cost more depending on several factors, the first of which being inflation. However it is a viable option for those wishing to spend less now and still capture rainwater. A Dry system is the simplest system to install. Many homeowners simply install a rainbarrel. These are great to have, however since an inch of rain on a 1000 sq ft roof yields 623 gallons of water approximately, a typical rainbarrel will overflow in a hurry. A system, custom designed to fit your needs is a great alternative. Our systems are designed in such a way that there is no issue with mosquitos since the pipe flows directly into the tank. We listen to what you want and design a system that meets your unique needs. Rainwater harvesting systems can be beautiful and efficient. Contact us today to start your custom design. Questions and comments are welcome below. Categories: Catchment Surface, Cistern, Drainage, Dry System, First Flush Diverter, Gutter, Rainbarrel, Rainwater Harvesting, Rainwater Runoff, Tanks | Permalink.